Bangkok has always defined Thailand for me with a little Phuket, Pattaya and Hat Yai thrown in. But from my trip to Chiang Mai last month, I’ve discovered a new love for the Land of Smiles. Things are cheaper there, the people friendlier, pace of life less hectic, and great natural landscapes for outdoor adventures. Any trip to Buddhist Thailand would not be complete without a visit to its many temples. The temples in Chiang Mai share many similar features with Thai wats across the nation with the exception of having many small bells hang off the temple roofs. The decorative style and colours of temples here are also pretty varied and makes for an interesting visit. 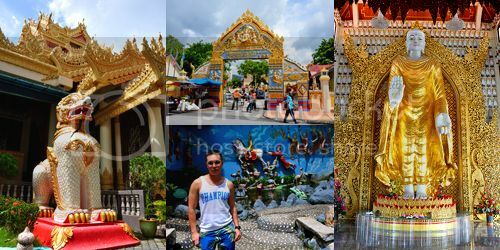 I went to Wat Chediluang, Wat Phantao, Wat Pra Singh, 3 other temples along Thapae Road and the famous mountain temple of Doi Suthep. Something happened while I was at one of the temples taking photos. I don’t know if it should be called a spiritual ‘warfare’? At one of the few unnamed temples that I was taking photos at, a monk called to me. He asked me in to his prayer room so that he can pray for me. I declined the offer, but he insisted. So I went in, knelt down and he tied a white string around my pressed palms. I'm Christian by the way and praying to idols is against the second commandment. But I didn't want to let the monk down nor dampen his good intentions. So while he chanted prayers, I kept saying sorry to Jesus. He sprinkled water on me as blessings, and I rationalized that I was not praying but receiving blessing from another fellow being. That was my first time being blessed in Buddhist goodwill. Then the monk tied a fragranced braid around my wrist and told me not to take it off. After that, he removed the lid from the silver container next to him and asked if I would like to donate. I donated 100 bht. 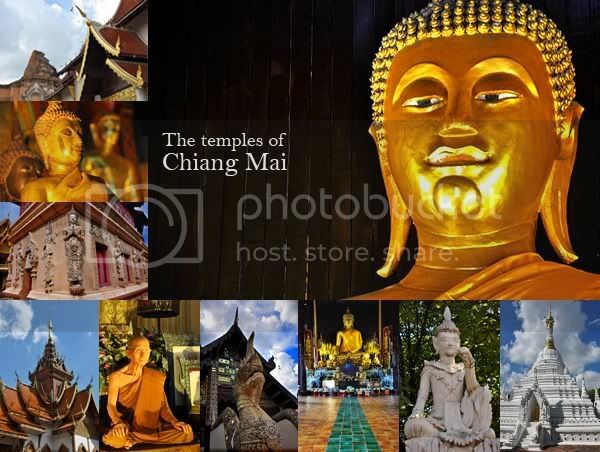 The biggest and most prominent temple in Chiang Mai is Wat Prathat, located atop Doi Suthep. 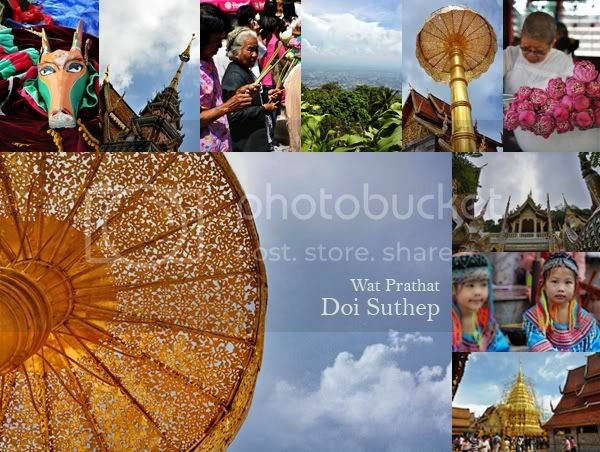 It is commonly referred to as just Doi Suthep, although that is the mountain’s name and not the temple’s. 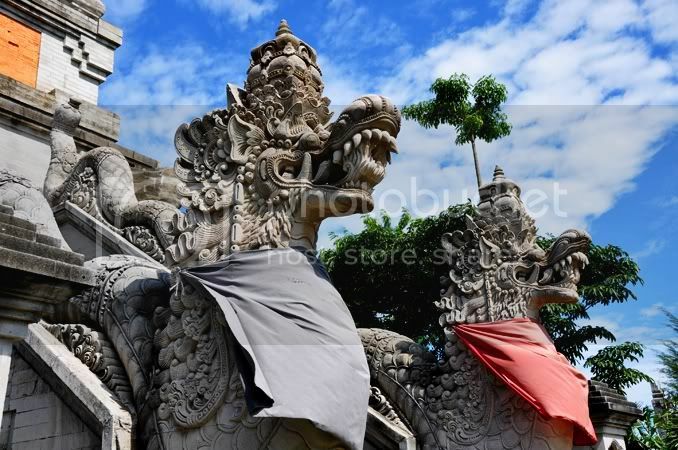 According to legend, the temple is built on the spot where a white elephant carrying a sacred relic, believed to be Buddha’s shoulder bone, had trumpeted three times and died. To get to the temple, you have a climb 309 steps to reach it. There’s a sign that calls for visitors to pay an entrance fee but I just walked right in. You have to dress appropriately to visit the temple and shoes must be taken off before going into the central temple ground. Doi Suthep has lots of children in colourful tribal costumes performing cultural dances and music for a donation. Being high up, you can also get a bird’s eye view of Chiang Mai city on a clear day. When I was there, the main stupa was undergoing refurbishment works so any hope for a nice photo was marred by iron poles. Getting there is rather interesting. Eugene and I took a red tuk tuk from the city. These tuk tuks usually charge 20 bht per person to go anywhere and I thought that’s the price to Doi Suthep too. But no. At the foot of the mountain, the driver came out and asked if we wanted him to take us up and down for 400 bht. We said no so he dropped us at a stop where a roadside operator charges 140 bht person to take us up to Bhuping Palace, Doi Suthep and back down. For these roadside operators, they’ll move only if they can fill a tuk tuk which can sit 8 people comfortably. If there’s less than that number, you’ll have to wait for an unspecified period of time for the passenger seats to fill up. So on hindsight, maybe 400 bht is a better deal to have our own tuk tuk driver for the trip. But that’s to Doi Suthep only. I wonder how much it’ll cost to charter a private tuk tuk to include Bhuping Palace as well. Thais are known for their friendliness and mild manners, but in Chiang Mai, I discovered they have a great sense of humour too. 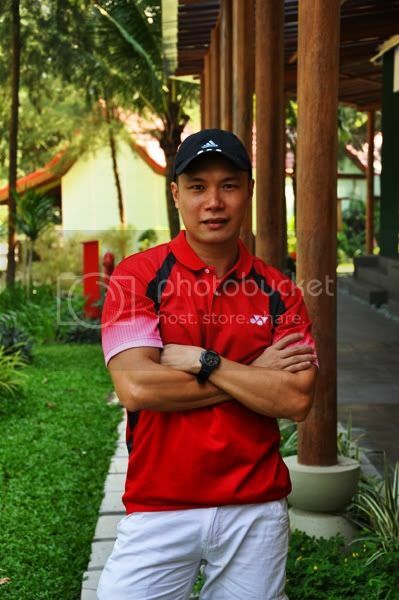 Especially memorable was the check-in receptionist at Centara Hotel. She's the most humourous hotel staff I've ever met. She cracked a lot of jokes and was very vivacious. She even got us the elephant camp day trip at a discounted rate (we checked with the other tourists during our tour and our price was slightly cheaper). When I requested to take a photo of her and show my mother, she immediately said my mum would think Chiang Mai ladies are fat and ugly like her. Well, I don't think so. She's a spark of life just like the many people I encountered during this trip. I really love taking the red tuk tuks. There’re like travelling communication pods where you sit so close facing a stranger that you can’t help but smile and say hello. We met this retired American teacher and his lady companion on our way back to hotel and ended following them to a flower exhibition at a shopping mall we otherwise would not have went. Nature tourism, if it doesn't involve being parked at the beach with a cold beer in hand, doesn't appeal to me. 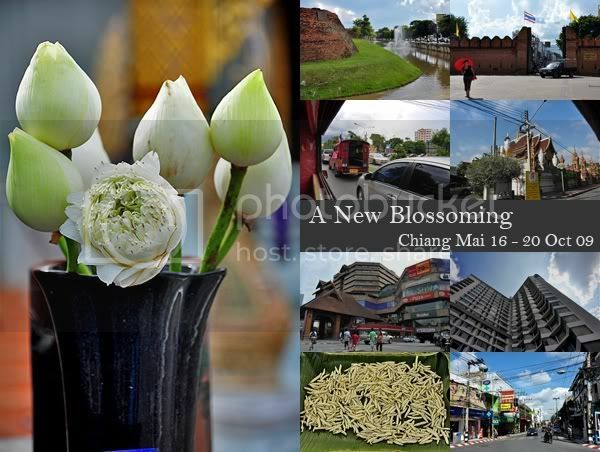 But that was until I came to Chiang Mai. After coming back from the trip, I realised there’s so much that I’ve yet to do and see. 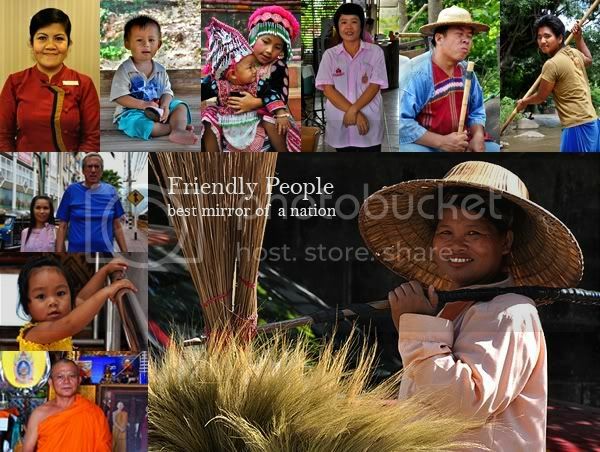 For the next trip, I’ll definitely go on the hill tribe tour to visit the long-neck women (Karen Tribe), try the Flight of Gibbons, visit Doi Inthanon National Park and maybe even try exploring Chiang Mai on a motorbike. During this trip, much of my encounters with nature were at Bhuping Palace. Further up-mountain from Doi Suthep temple, this tourist attraction wasn’t originally on my itinerary but did it so that everyone didn’t have to wait any longer at the tuk tuk stop (see Doi Suthep portion above). 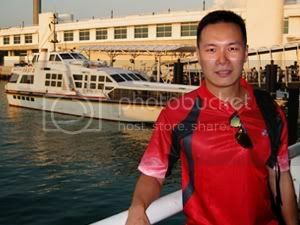 We took the ride with two young girls from Bangkok (one of them is named Bung) and three mainland Chinese. It was great meeting them and I’m surprised that in China, it is common for travelers to post their itinerary on travel websites to look for travel buddies. Two of the Chinese travelers were siblings and they met the third just a day before and went on tours in Chiang Mai just like that. And I thought they were long time friends. Pretty amazing. I don’t know much about Bhuping Palace except that it is rather chilly and foggy (when I was there), and the road up is suicide for people with car sickness. An entrance fee of 100 bht (I think) applies and appropriate dressing is a MUST. Guys in bermudas are not allowed. Eugene had to rent long pants at the entrance which costs 50 bht. There weren’t many things to see at Bhuping Palace except for the beautiful roses, flora and fauna. 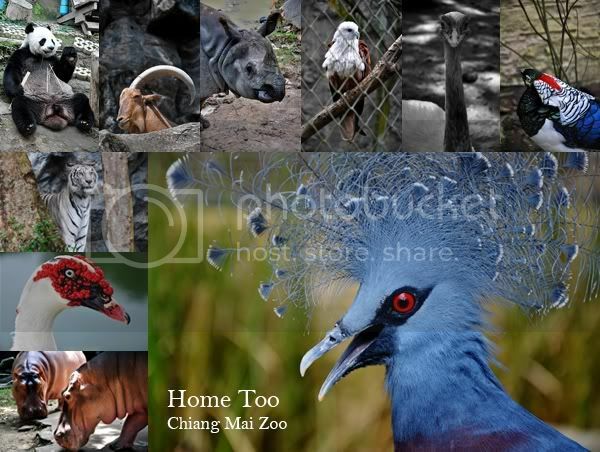 But Chiang Mai as a whole offers lots of opportunities to get close to nature with the various land tour packages and proximity of these places. Golden padi fields stretching towards mountain valleys under blue skies decorated with massive clouds. Yeah, the hills are more than alive. Julie Andrews would be so envious! But a minute under the hot sun to admire the raw state of what goes into my rice cooker was enough. Being able to see far into the horizon was really awesome. It was a beautiful scene and I watched this while riding on the back of an elephant. 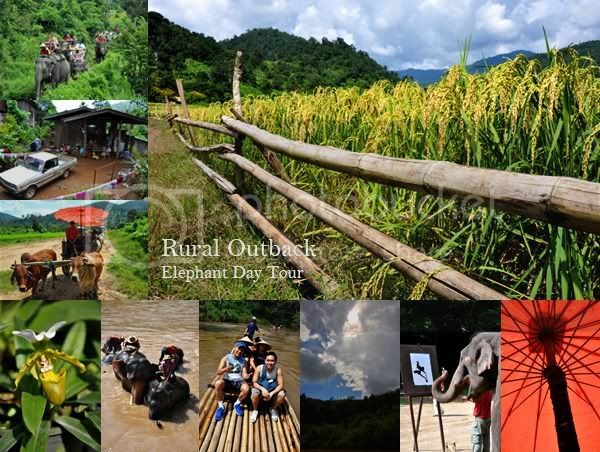 The rural trail was part of the elephant camp tour package which also included performances by the leathery beasts, ox cart ride, lunch, a ride on the water rafts, and a visit to an orchid farm. We paid 900 bht per person for the day trip which costs 1,000 bht. Although the elephant camp segment was boring for me (taking photos with the elephants, see them bathe, play ball, perform tricks and paint), the day trip as a whole wasn’t too bad to have a glimpse of rural life. Be prepared to tip the mahouts though and like many touristy places, commerce is never far. The zoo has a dual price system… foreigners pay double the price of locals. The entrance fee costs 50 bht for Thais and 100 bht for foreigners unless you have a student pass or working permit. Still, it is still much cheaper than the S$18.00 that the Singapore Zoo charges, but of course premium pricing brings with it experiences of a different quality. The key attraction at Chiang Mai zoo would be the pair of pandas on loan from China (Singapore had recently been given a loan too and the pandas will come here in 2011). They had given birth to a baby panda in May this year so the hype is attracting lots of visitors. An extra charge of 100 bht is payable at the entrance to the panda exhibit. When I bought the tickets, I was sold the local ticket of 50 bht each. But at the door, the ticket collector spoke something to me in Thai that I cannot understand. She promptly sent me back to top-up my ticket to match my tourist status. It’s air-conditioned in the panda enclosure and do go early (about 9am) as they’re active only during the morning feeding time. In fact, most of the animals are active in the morning due to the feeding schedule and cooler air. There’s also a newly completed aquarium at the zoo and the admission charge is an additional 450 bht. I didn’t go for it. To get around the zoo, you can walk (which I did), get tickets to ride the tram, or paid to ride the monorail. Go for the tram option as there’re more stops and it moves faster than the monorail which has only 4 stops. On the whole, the zoo is not too bad a visit to remind myself that our Earth belongs to these magnificent creatures too. My favourite was this white ostrich with blue eyes that seem to know its photo was being taken and actually poses for it! For more photos from the trip, please visit my album Peace of Mai. Batam scarred me for life. When I was 12 years old and had just gotten my BCG injection, I went to Batam because my father had a small business there. I can't recall what he dealt in, but it's definitely not fatherly duties. Those days, Batam was pretty much undeveloped and brown-dirt roads were the highways. For leisure, the locals would drive into the forests and splash around in one of the many natural rock pools. The water was so clear, I could see the bottom along with the small fish that were traumatised by our visits. I loved these excursions to nature but I didn't yet know how to swim. And one time, someone pushed me into the waters. I can't swim. I struggled frantically and in the process, broke the blister of my BCG shot. I was rescued, but my punctured blister began to rot in the days that followed. I won't go into details about the process but I ended up with maggots on my BCG wound and had to see a doctor to clean it up. Twenty-three years later, I'm back in Batam. The roads changed, but the dirt remained. That old country feel still glowed, but somehow, it has lost its innocence. 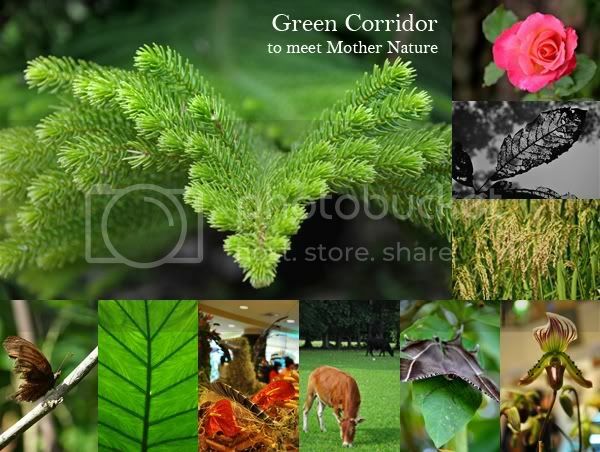 Insofar, it seemed a last minute bastardisation of commerce and natural landscape. Therein lies its charm and inconvenience. To take a break from the many responsibilities of Singapore living, I returned to Batam. Unfortunately, I wouldn't say that the place was worry-free. If not for the great company I had, Batam would be trying my patience for a 3 days 2 nights stay. Here are the highs and lows of my recent re-visit to Batam. Hopefully it'll provide some useful information if you're planning to make a trip. As what we look for is different and every experience would be unique, take everything I say, good and bad, with a pinch of salt. And sometimes photos can make something look better than it really is. 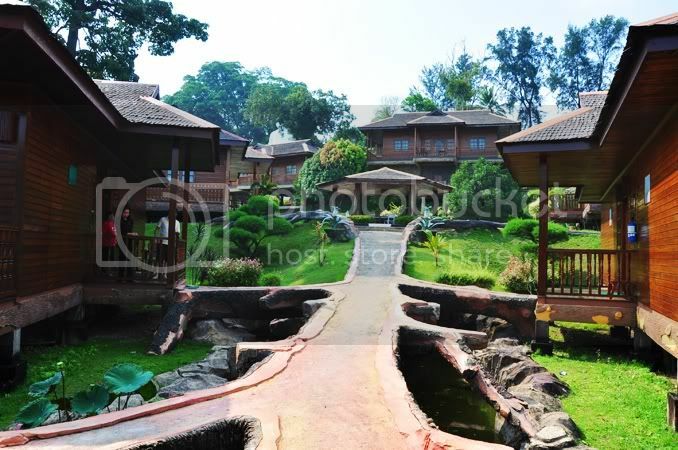 For KTM Resort, we paid S$100 for a Deluxe Cottage with breakfast for 2. It also offered a free transfer to the ferry terminal which was less than 10 minutes away. While the resort hotels and some cabs accept Singapore dollars, the local businesses prefer Indonesian rupiah. The exchange rate was S$1.00 = Rp 6,750. Harris Resort is every bit the family hotel with loads of multi-generation activities right down to the children-friendly colours. The rooms are pretty big and they have adjourning doors so it’s great for large groups. My grouse would be the mildewy smell along the room corridors. The hotel looked like it could use a holiday itself. But a new wing next to the yellowed-ager has just been completed and looks ready for singles and honeymooners. However, I suspect a pool full of shrieking kids would have the effect of turning champagne into beer. The landscaped pool is the best part of the hotel. It is clean and lined with cuddle-baskets (or baby cots, depending on who’s interpreting the pool-side furnishing) and in the path of the sun so you don’t get building shadows marring an early morning or late afternoon tan (since skin cancer is purported to photosynthesize between 11am and 4pm). 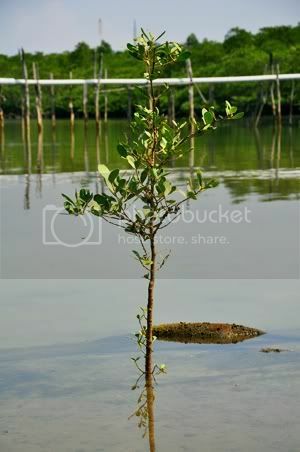 And a nice pool IS IMPORTANT because the coastline around that area is so awful, even crabs won't want to live in them. Even the water sports hub opposite the hotel is nothing more than a large pond dug into the ground. If you would like to see what a kampung scene might be like, you won’t be disappointed here. 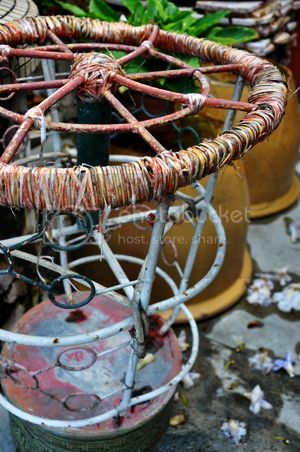 That’s the rustic charm; I imagined that the days of the sampans must’ve felt like this. 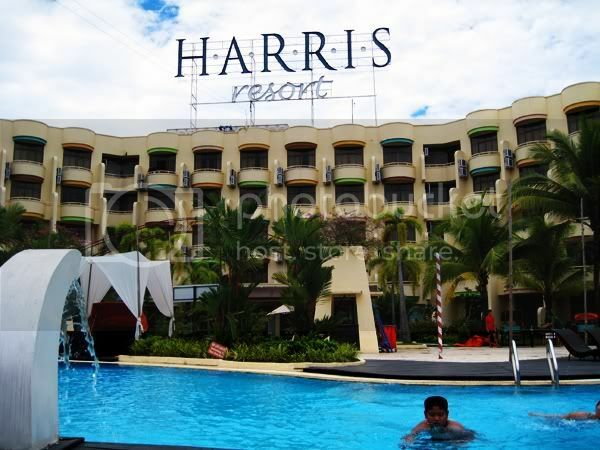 Harris Hotel is near the Waterfront City Ferry Terminal in Batam. Although it’s called a waterfront city, I thought Tarzan would’ve been more comfortable here. In front of the water it is, but to call the area a city requires a very lively imagination. Or delusion. The star attraction of the Harris Hotel 2D1N package is the 1-hour massage at its in-house spa outfit, H Spa. It is located atop an annex building that houses a gym, karaoke, gift shop, bowling alley and billiard room. The place has the look-and-feel of the old Toa Payoh SAFRA, but H Spa managed to mimic, with some success, the ambience of a spa village. I tried the Indonesian massage and it’s pretty good. At least it didn’t feel like the masseur was trying to tickle me. But, the experience would’ve been much more enjoyable and relaxing had I been allowed to take a shower before being kneaded. Batam is humid. I’ve just returned from a half-day Nagoya town trip (and being trapped 45 minutes inside the hotel’s 12-seater minivan which broke down on our way back) and had perspired so much, the skin between my thighs was giving me a bikini wax. I did request to bathe, but was told to do so only after the massage. But after the massage, we were promptly led out towards the exit until I asked about showering and the complimentary use of their spa facilities. Thankfully I asked. How does bubbling away muscle tension is an open-view jacuzzi while catching the golden hues of a sunset sound to you? How did she know that?! So far, we’ve only exchanged about 5 emails and I haven’t even checked in to KTM Resort yet. I received that response while trying to book a night’s stay at KTM. There is no online reservation function at its website and the only way is to email them. I tried approaching the 2 Singapore agents it listed, but I was turned away as they only made arrangements if I took a spa package that includes lodging. Yet the irony was, even if I had wanted to take the package, I couldn’t because all the spa therapists had gone home for Hari Raya Puasa. The Muslim holiday was on 20 Sep 09 (Sunday), my trip was from 23 – 25 Sep (Wednesday to Friday). I wanted to stay at KTM on 24 Sep (Thursday) but the therapists will only be back on 25th, so I had to contact the resort directly to make a room-only arrangement. I emailed KTM weeks before my trip and waited another ice-age before I got a reply from a staff. Let’s call her S. I asked for a Deluxe Cottage at S$85 a night with free pick-up from Harris Resort (the room rate includes free breakfast for 2, and a 2-way free transfer from Sekupang Ferry Terminal). Her reply didn’t answer my requests. So I wrote in again, waited, and finally called. I was told that they’ll confirm my booking by email. Then I got a reply giving me another room type. So I wrote in again to ask for the Deluxe Cottage, which I stated in my first email, at the weekday rate of S$85.00 a night (weekday and weekend rates are different). I waited again. No response. I called again. S told me she needed to confirm with her manager about the pick-up from Harris. Getting closer to my travel date and still no response. So I emailed again and got the “you look so funny” reply with a confirmation to stay in the Deluxe Cottage at S$100.00 (weekend rate) and no free transfer from Harris. If I wanted them to pick me up, I had to pay an extra S$50.00 for the service (is it a loanshark hotel?). I wrote in again saying 24th Sep, being a Thursday, should be charged at the weekday rate. The reply was that it was still the Hari Raya holiday period so it is a weekend rate. But, Harris Resort didn’t charge me a weekend rate! Anyway, I got the accommodation type I wanted without free pick-up and a breakfast buffet with only 3 choices – fried noodle, friend rice, and fried kway teow. But despite all that, I thought KTM has great potential to offer a unique lodging experience. It is like a grain of sand, a potential seed to become a pearl. 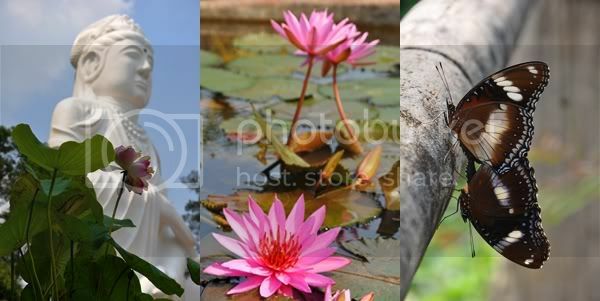 Or a yet to blossom lotus bud (lots of lotuses there since the resort has a very strong Buddhist influence). KTM has a great seafront view, a supposedly therapeutic, natural seawater pool (though I didn’t try), comfortable rooms, close to nature (but beware the mozzies), and quirky landscaping that are attractions all unto themselves. Having travelled to quite a number of places in Asia, I’ve come to the conclusion that regardless the destination, be sure to visit its religious monuments. These totems of man’s faith describe the size man’s fear of the afterlife and an attempt to exert control on fate, destiny, luck, or whatever we call it. I mean, aren’t prayers a way of telling or requesting the unseen for a desired outcome? That’s a construct of hope. I guess. And I am a hopeful person. So I have no qualms in embracing the different triggers that make living more bearable. I’ve seen many Chinese temples, Muslim mosques, Thai wats, and English Churches, and their design and scale never stopped taking my breath away. 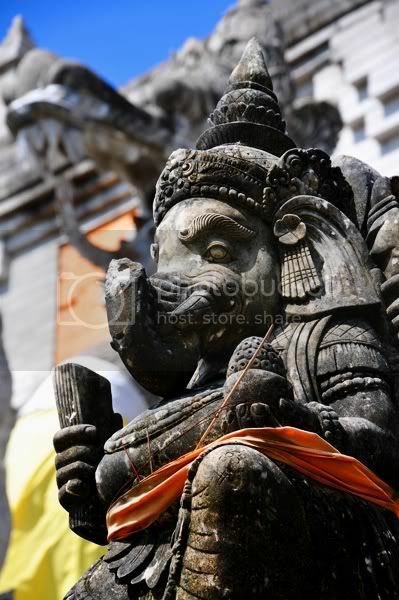 But in Batam, I encountered an image of Hinduism that was new to me. There were no rows upon rows of brightly coloured sculptures of deities and animals, but white-washed stone carvings of fearsome creatures. 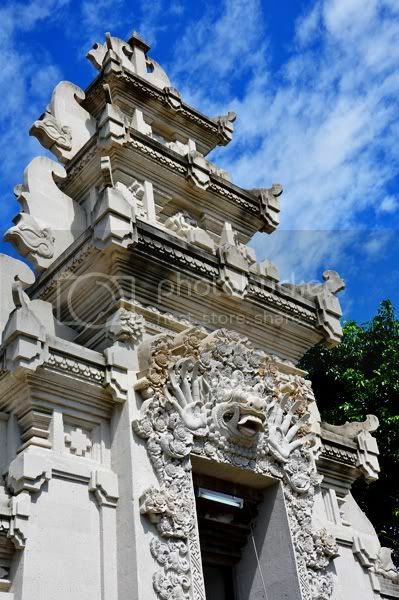 I’ve read of Shiva, Mount Meru and some mystics of Hinduism, but Pura Agung baffled me. What is that serpent-dragon? My lack of knowledge notwithstanding, this temple is unlike what I’ve seen and the ‘no photography’, ‘no visit by menstruating women’, and the no going up the main stupa rule only piqued my interest further. But please don’t think I disrespected the ‘no photography’ rule. When I was in the historic site, masons working to restore the temple actually encouraged me to take photos, and take lots of them so as to share and raise awareness about that place. Well, here’s my tribute to the great masonry. 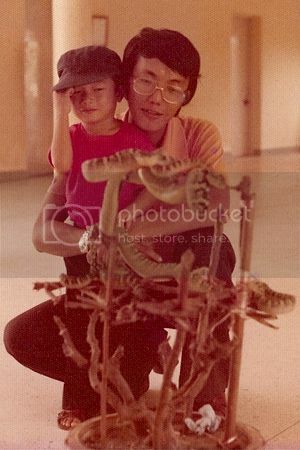 My only recollection of Penang was from an old photo of me looking at some snakes coiled on sticks at the Snake Temple. My father had his protective arms around me. I had a slight smile but my body language betrayed my true sense of security in my father’s embrace. Perhaps that’s a child’s intuition of the destructive force that his father will later become. I don’t remember much of Penang so my recent trip there was as good as stepping on the island for the first time. 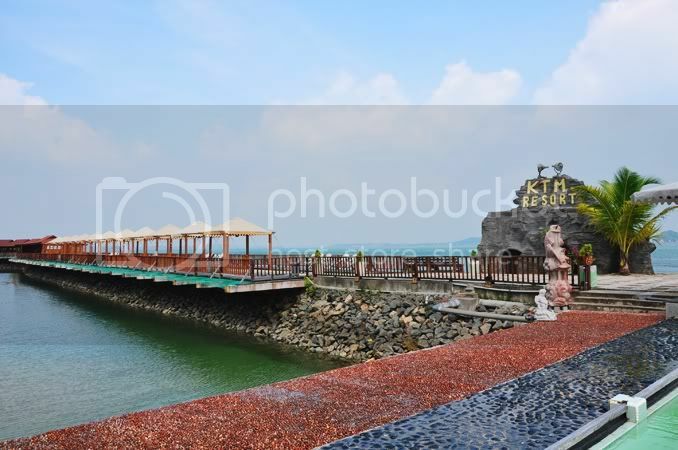 I did quite a bit of pre-trip research and the numerous travel guidebooks and websites I consulted about Penang call it the ‘Pearl of the Orient’... a title that’s been equally bestowed on Macau. But in comparing these two island cities, Penang had a higher chance of giving one a pearl necklace although Macau seemed more of a shimmering jewel with its brightly-lit casinos and neon signs. Situated along Burmah Road, Tune Hotel is less than 10 mins walk to the city centre, KOMTAR. Burmah Road runs parallel between Penang Road (which leads to the Heritage Trail) and Macalister Road (that serves lots of hawker food) so it is pretty convenient and accessible. Although very compact in size, the room is clean and modern with pleasant floral prints on the walls. It is really just a place to sleep and house your luggage with very little walking space. Air-conditioning is not included in the basic room rate. You need to purchase usage hours for air-con and hair-dryer, and rent the bath towels. 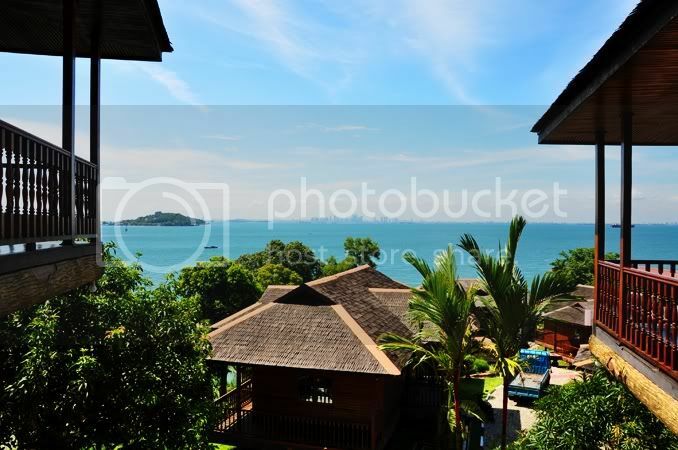 Cost for 3 nights Double Room (incl. air-con usage and 3 towels) – MYR171.57 (S$70.30); approx. S$11.70 per person per night. VERY CHEAP!! Since it’s so affordable, we extended the room for another day to house our luggage and shower before heading back as the Check-Out time was 12:00pm but our flight was at 8:00pm. The extension costs MYR73.90 (S$30.30). Who needs time travel machines when there’s Penang? Well, at least for me, it was a return to familiar childhood sights and scenes. A kind of displaced nostalgia where five-foot-ways bring recognition, but not the memories of me running down the corridors. 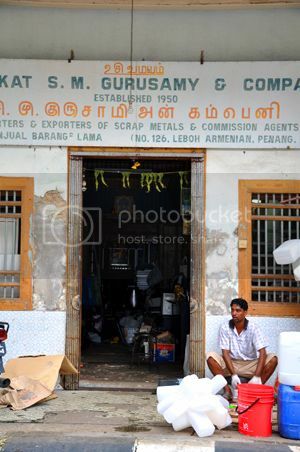 Also known as Pulau Pinang, Penang is a live museum of the trades and possibly, way of life many decades back. The clothes may have changed, houses have internet access now, but that old world charm of unhurried ease in watching days go by lives on. The city is deeply steeped in historic remnants and a portmanteau of cultures that earned it a place in UNESCO’s list of world heritage sites. During this trip, I covered part of the heritage trail that brought me to Chinese temples, clan houses, churches, mosques and Indian shrines (of course I can find all these in Singapore too but not within such close proximity to each other nor are many of them as old); sampled the nature-scape of this island, and dived into its famed hawker fare (though my taste buds were rather disappointed). Without wasting a single moment, I went straight to the Snake Temple as soon as I landed in Penang. With luggage in tow, I was eager to be back here after 30 years. The Snake Temple is very close to the airport, about 10 mins by cab, but it costs MYR26.00 as the fare is fixed by the only cab operator allowed at the airport. I was told that cabs not registered with the airport cab service cannot pick up passengers at the airport. So passengers don’t have a choice but to pay the exorbitant fare it charges. Called the Temple of Azure Cloud (清云殿), it was built in 1850 to honor Chor Soo Kong, a monk held in high regard for his ability to heal. From what I read, snakes appeared at the temple to seek refuge after the temple was built. Taking it as a good omen, the snakes were welcomed and allowed to roam freely in the temple. However, during my visit, my burning question was, “Where are the snakes? !” I don’t even see a worm around, let alone free-ranging poisonous vipers! The vines for snakes to climb are all empty (I was later told by a cab driver that snakes are lesser in numbers now because crows come and pick them off the open-air branches). In order to see some snakes, I had to pay MYR5.00 to visit the in-house Snakes and Reptile Exhibition. It was a poorly maintained, sort of makeshift apology for the lack of snakes in a Snake Temple. I don’t blame them if the snakes were not there since they come and go at will. But to cash in on the temple’s repute? And a haphazard one at that! I was very disappointed. Exiting from the rip-off exhibition, I came to an area where tourists pay to get their photos taken with pythons around their necks. There were some green and yellow snakes coiled atop fake branches and stakes. They were rather high up. They don’t look real. I thought I smelt rubber on them. It is blue alright. And one of the bigger attraction in Penang. But I call it the ‘Boo’ Mansion… like how L.A. soccer fans booed David Beckham off the field and calling him a fraud. The curators at the Cheong Fatt Tze Mansion have such a snooty attitude, I can see the pi sai (Hokkien for ‘snot’) in their upturned noses. “Then you cannot go in. You must join the tour. It’s MYR12.00 per person,” he said. “But I don’t need a tour, I just want to see the mansion. And it past the tour time,” I replied. “You can still pay and catch up with the tour because it just started,” he continued. “You mean I can only see the mansion during stipulated tour times? That’s not stated in your website…” I protested. “It’s written there (pointing to a notice panel by the door), you cannot read is it?” he asked. What the f@#*! I came here because the mansion is beautiful and I want to photograph it and I paid f@#*king MYR12! But the worst was yet to come. The tour was conducted by this matronly lady who was very articulate, but probably too proud of her knowledge about feng shui of the Boo Mansion, and talked down to us with an air of superiority. I agree that the precision feng shui plan and studies that went into the construction of the mansion was remarkable, but spare me the smugness of knowledge. Even the Caucasian tourists among the group were seen giving each other the look of exasperation countless times, not because of what was being said, but how it was said. To top it off, there’re addition staff that follow you around during the tour to make sure your don’t side-step or take photos. The Boo Mansion house guests and only they have the privilege of photographing the place from inside. I can understand that special treatment. Then my point is, don’t charge freaking MYR12.00 for an hour’s tour and please state clearly in your website that non house-guests can only visit the mansion at the 2 stipulated tour times. And please inform the unknowing public that we’re not allowed to take photos of the interior. 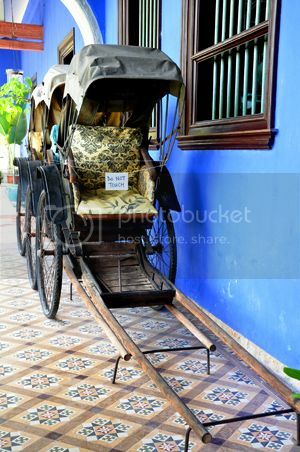 The sign on the trishaws says “DO NOT TOUCH”. The curators don’t even bother to add ‘Please’. If I’d know earlier, I wouldn’t have come here because this place adds nothing to me by being physically present. Never mind that my first day was a little disappointing. 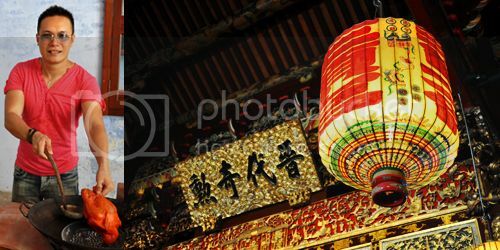 I look forward to visiting the biggest Chinese temple in Malaysia on the second day. And it rained. The weather at Penang during August was rather erratic. It’s sunny, gloomy and rainy all in one day. Nevertheless, we hired the van from Tune Hotel to take us to Kek Lok Si Temple. The 20 mins single trip costs MYR25. Getting around Penang in hired transport sure is expensive! 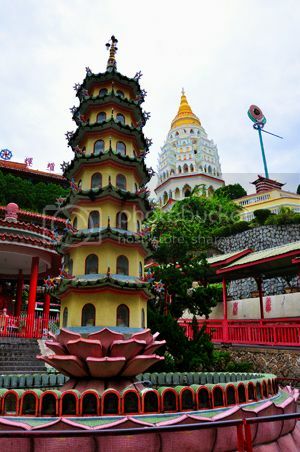 Kek Lok Si sits atop a hill at the Air Hitam precinct and is purported to be the largest Buddhist temple in Malaysia. It has three parts – lower temple where all the retail shops are, mid-temple where the thousand-Buddha pagoda stands, and the top level where a gigantic statue of the Goddess of Mercy towers (unfortunately, the statue is covered in scaffolding now due to construction works for a pavilion to house it). You can take a cable car from the middle to the statue and it costs MYR8.00 for a two-way ride. If not for the morning showers, I could imagine what a spectacular view the temple offers. You can see the whole of Georgetown (Penang’s downtown district) while lush green hills shrouded in mist surrounds you. I felt uplifted and in awe of the not-so-distant hilltops dressed in fog. There’s also a liberation pool at mid-temple where hundreds of tortoises are released into captivity. Such an irony. Some of the tortoises are really huge and looked like they’re of the same species. You can purchase vegetable at MYR1.00 a bunch and feed it to the reptiles. This place is definitely worth a visit. Hidden in an alley within rows of nondescript pre-war houses, the splendor and intricately decorated Khoo Kongsi resides. For an entrance fee of MYR5.00, I must agree that this place is a must-go because not only is the building opulently decorated, the owners cleverly turned the lower level into a gallery and museum about Khoo Kongsi. 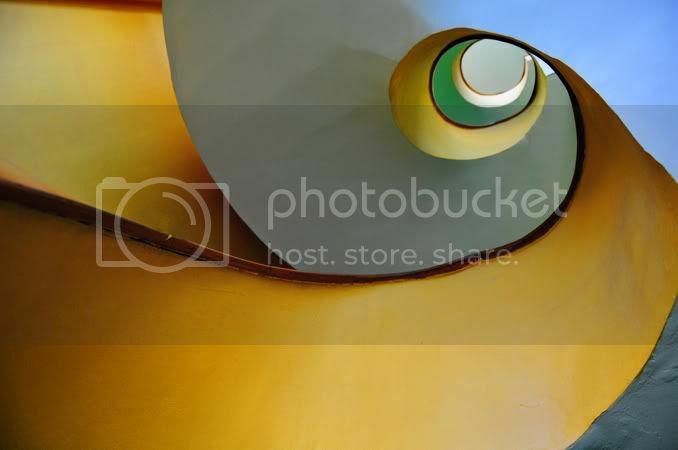 This gallery and its exhibits are definitely kept in better condition and more interesting than the junkyard at the Boo Mansion that showcases artifacts and vintage memorabilia. 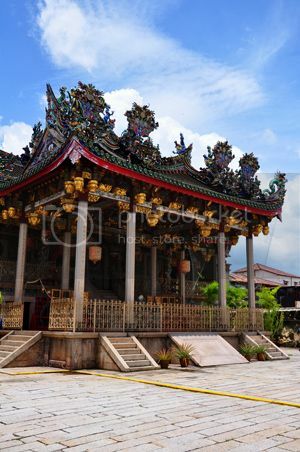 Built in 1901 and founded by Hokkien immigrant workers in Penang, the Khoo Kongsi is rooted firmly in Confucius’ values such as filial piety and respect for the elderly. The clanhouse even has a room with plaques that list notable members of the Khoo clan that have done the community proud. There’s even a mock-up of a kitchen scene of how early settlers lived and dined at this club that also serves as a prayer hall. 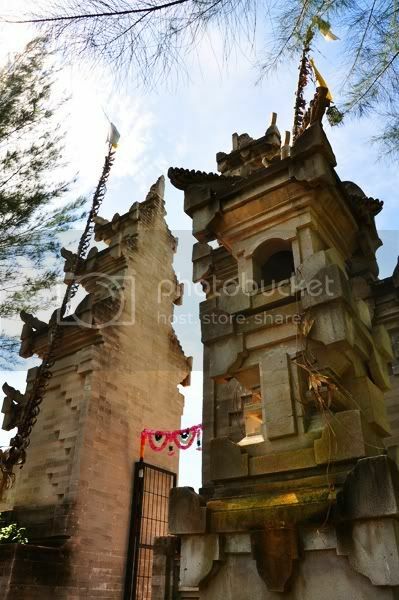 Like many of the Chinese temples and clanhouses in Penang, the rooftop of Khoo Kongsi is cluttered with the Chinese architectural art known as 'Chien Nian' (剪粘) where colourful shards of glazed ceramic are pasted together to form decorative objects. These objects are usually auspicious symbols in Chinese mythology such as dragons, phoenixes, and celestial scenes. But to me, it's a whole mess up there! A beautiful mess nonetheless. I loved this place for the opportunity to get up close and very personal with creepy crawlies. And the best part is, I get to touch and hold them! Totally awesome! 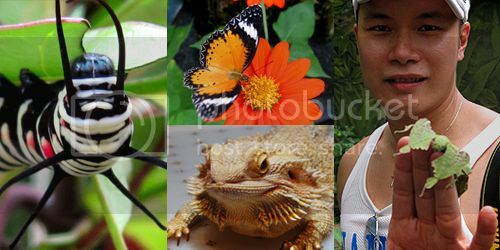 Many of the insects look fearsome and dangerous but are actually very docile and gentle. I got friendly with a few species of mantises, giant millipedes and a horned lizard native to Australia. 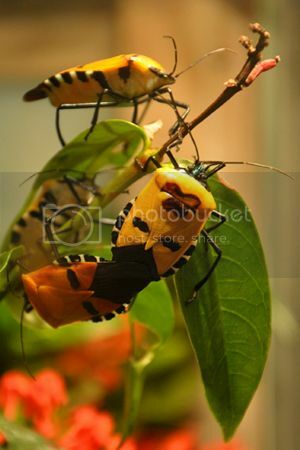 The Butterfly Farm is about a half hour’s drive from Georgetown and an entrance fee of MYR20.00 for adult applies. I think they have different prices for different types of visitors. We were asked where do we come from and when I replied Singapore, the ticketing person immediately said MYR20.00 per person. On the counter, I saw tickets in denominations of MYR20.00, MYR15.00 and MYR10.00 (for children). Walking into the farm, I felt like I trespassed the lair of fairies… but with a strange smell of overly ripe bananas. Established in 1986, the farm supposedly housed around 4,000 butterflies from 120 different species. But I counted only around 10 different types. Yet, it was still a magical experience. From what I read, if you put on sweet smelling perfume, the butterflies will land on you. I don’t usually put on perfume but two butterflies did land on me. Maybe they like my B.O. There are two showtimes at 11:00 am and 3:00 pm where visitors can learn about and feel some of the insects. But my favourite was the leaf mantis in the general exhibit area. It really looked like a piece of leaf from the plant it was hanging on to and when you hold it in your hand, it moves around gingerly in a tapping manner and is so very polite. There are also man-faced beetles, giant weevil beetles, exotic reptiles and glowing scorpions in encased exhibits too. These creatures are really amazing and beautifully designed. Just pray your visit does not coincide with sweaty school groups that emit a natural human insecticide. In addition, if you're prone to car sickness, the winding road along Batu Ferringhi that leads to it will be a puke fest. 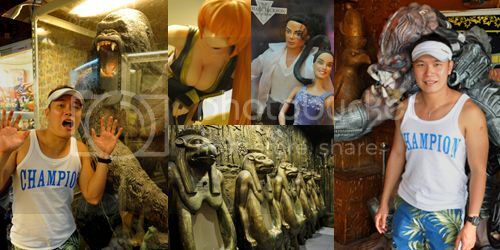 Before coming to Penang, I didn’t know there was a Toy Museum. But even if I knew, it wouldn’t have been an attraction for me. I guess I had too many things to worry during my childhood than playing with toys. But I did have a collection of Zoids, M.A.S.K. and He-Man toys. And also the ET figurine in the picture. I had one just like that with its finger tip lighting up whenever I pressed a button. At one point, it was my favourite toy. We came to learn about the Toy Museum from a flyer. Since we had time and it was along the way back from Butterfly Farm to Georgetown, we decided to pop by. The biggest draw for me was not the toys, but what was on the flyer. Printed on both sides, the A4 sized leaflet was laid out with thumbnail images of toy exhibits there. 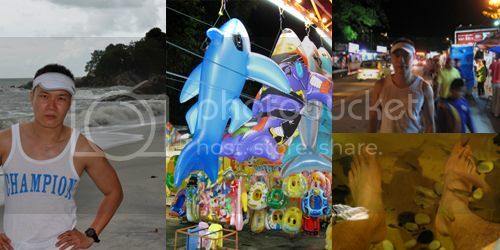 But in many of the photos, a bespectacled uncle in white shirt appeared in them posing with the life-size toys. I think he must be the owner or something, but such misguided self-promotion was hilarious. My pic below taken with King Kong was an imitation of his pose with that same exhibit. At the museum, expect to see many different series of toys housed in glass shelves and some life-size replicas of movie characters and heroes. A lot of the toys were playsets from movies or TV shows spin-offs such as Star Wars, Spawn, Lord of the Rings, Alien, Disney and Pixar cartoons, Japanese anime, Barbie Dolls, etc. Some of these toys, especially the ones with lots of blood and gore and the undead, were very captivating. They looked so real and eerie. I’ll post photos of these toys on my Facebook later. The entrance fee was MYR20.00 per adult although in the flyer, it was stated to be MYR10.00. It would be worth the visit if it was the latter ticket price but not at MYR20.00. I spent only about half an hour there and the museum didn’t even have the Zoids and M.A.S.K. toys that I collected so fervently. I even cleared out 4 glass shelves in my room to display toy models of Switchblade, Raven, Thunderhawk, etc from the cartoon series. But that’s just what I remembered of my toys. 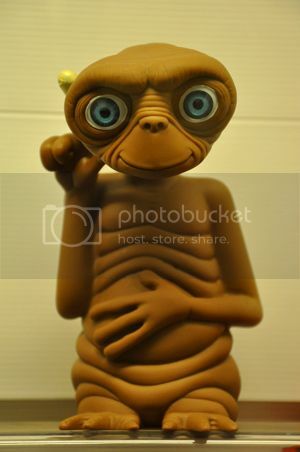 You may find a piece of your childhood there and rekindle some of that joy and memories like what ET did for me. For a first-time visitor to Penang, there’s pretty much to see if you’re into culture and heritage artforms. 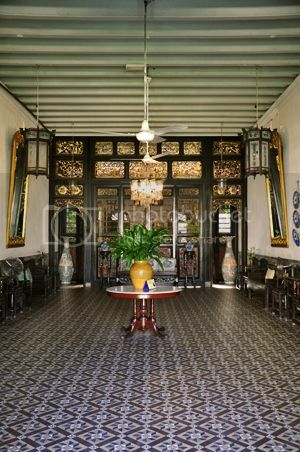 But for the many restored buildings or those left in disrepair, the pre-war colonial buildings are a common sight shared by Singaporeans, and possibly many others within the Asian region, during the British / Portugese invasion. We build monuments of who we are lest we lose our beliefs and identities. 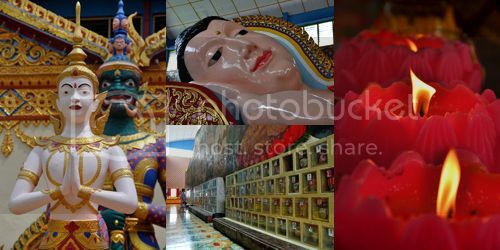 A Thai temple located at the Pulau Tikus area with a gigantic reclining buddha and columbarium. 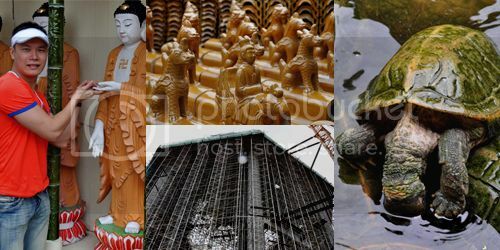 There are also 12 buddha statues there representing each of the Chinese zodiac sign. It is believed that if you make a donation at the statue that corresponds with your sign, good fortune and blessings will befall on you. Opposite the Thai temple is Dhammikarama Burmese Temple. The two temples' parallel location make for a good study and comparison of their approaches to Buddhism. Well, I'm not much enlightened at their differences but I can see that the Burmese like bearded beasts. Maybe the beard is a sign of wisdom or trustworthiness? 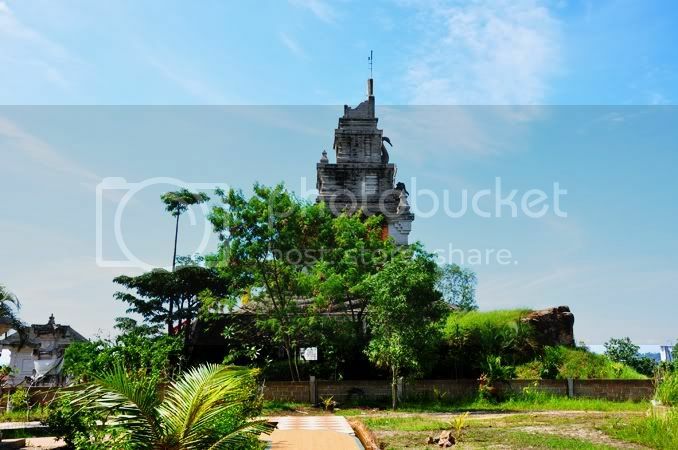 This temple was supposedly founded earlier than Wat Chaiyamangalaram and was probably the reason why the lane that leads to these temples is called Burma Lane. The temple houses a gigantic standing all-marble buddha. There're also loads of brightly painted statues there with a buck-toothed nymph being my favourite! 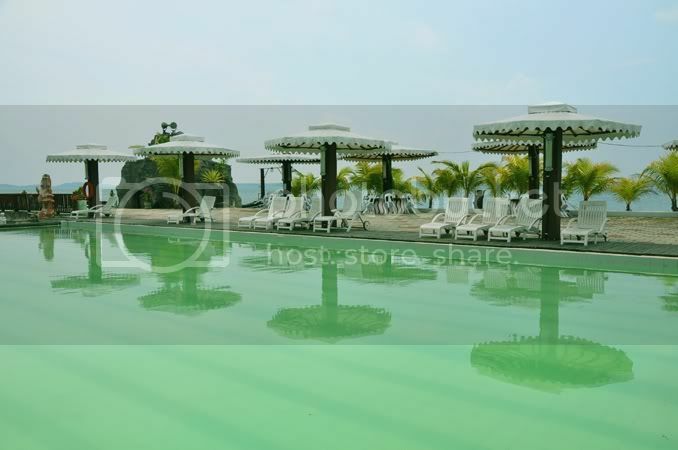 Batu Ferringhi is the beach resort stretch in Penang with loads of hotels situated alongside the waterfront. I had intended to soak up the sun and chill out here on returning from the Butterfly Farm but problem was, I couldn't find a stretch of the beach that looked proper for such activities! Maybe the hotels had blocked and hoarded the best of the seafront, the place looked nothing like the bright sunny, activities-filled photos I saw. And the day I went, it rained and the sky was grey and sulky. At night, Batu Ferringhi lights up as one of Penang's more popular night bazaar. You get lots of T-shirts and counterfeit garments plus something interesting knick-knacks but at a price you must be prepared to bargain. I overheard a stall-owner asking for MYR30.00 for an item. The buyer decided to walk away and the price was slashed to half. Still unconvinced, the stallowner decided to settle for MYR10.00. As someone who is too benevolent at price haggling, I skipped shopping with price ambiguity and headed for a fish spa... you know, those places where you stick your feet into a pool and becomes a buffet for a horde of fish. It was my first time. But the perpetually hungry shoal didn't go easy on me. For MYR30.00, I got 30 minutes to try two pools... one with smaller fish, and the other with larger swimmers up to 7 centimeters long. It was damn ticklish! Especially with the smaller fish. But after a while, I got used to the tickling feeling and it sort of got therapeutic from watching the fish coming to you. I don't know if eating my dead skin was their main source of sustenance, but knowing that you fed someone, or something, and it is alive because of you, was magnetic for me. I hoped I had more dead skin. "I go there with you... where the streets have no name... I can't take my eyes off of you." So sang Pet Shop Boys in the song that I so remembered, especially in contrast with a jetty of different households with the same surname! But I can't take my eyes off of Lim nonetheless. 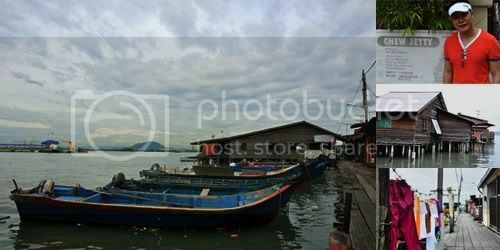 This is the Clan Jetty in Penang. It is also known as Weld Quay where a collection of houses on stilts form clan 'villages'. There're a total of 9 stretches (if I recall correctly), and each stretch of houses are home to families with the same surname. That is, if you go to the 'Chew' jetty, everyone there has the surname 'Chew'. From what I read, I don't see 'Ng' jetty, which is my surname, but I guess the jetties must be home to surnames from the Hokkien province of China. I belong to my paternal dialect group of Hing Hwa, which I believe is a dialect of Hokkien (imagine a dialect or a dialect! ), but I never quite confirmed my ancestory. Well, I live in Singapore and I'm encouraged to speak good English and good Mandarin. That's the Singaporean identity. Dialects are seen as cumbersome and undermining of progress because the human brain can only store a certain number of languages. If we allowed dialects, we will sacrifice the full comprehension of profitable languages. I am relatively bilingual but I also understood the world through Cantonese and Hokkien descriptions of life. I never quite learnt Hing Hwa though. It's a pity to lose the ability to express and be understood in non-mainstream languages, because they provide the last lineages to our heritage. So here's Penang, still preserving and proud of its homage to tradition. Penang isn't too difficult a place to navigate. The Heritage Trail with all its buildings of interest can be covered on foot as they're pretty close to each other. Wherever you walk, just look up and use the Komtar building as a reference point because it towers above everything else in Georgetown. To visit the Heritage Trail, you can also hop on the FREE shuttle bus known as the City Area Transit (CAT). The bus is pretty frequent (I think every 10 mins or so), air-conditioned, clean and comfortable. The bus travels in a loop and passes many of the heritage buildings. You can hop on the bus at the side of a bus interchange next to Komtar. Or you can take one of the many trishaws to visit the sights and experience yesterday once more, except that you'll be sucking up car fumes and bring about global warming in your body. Alternatively, you can try taking the public buses which charges about MYR2.00 per trip. The buses are of a standard much like the SBS buses here in Singapore. But always ask the bus driver if your destination is in his route because it seems like the same bus number at the same bus-stop can have different routes. There many ways to get around in Penang, but do you know what's the worst way? It's by cab. It's pure daylight, and night time, robbery! The cabs don't go by meter so you'll have to negotiate the fare before getting on. I've mentioned how much it costs to get from the airport to the Snake Temple earlier, and from the temple to Georgetown, a ride of about 20 mins, the fare was MYR35.00! And a cab we took back to hotel after a night at Gurney Drive costs MYR15.00 for a less than 15 mins journey. So we decided to rent a car on the day where our itinerary was planned for further out explorations such as the Butterfly Farm, Toy Museum and Batu Ferringhi. The car rental was MYR120.00 a day. It's about a 45 mins drive to the Butterfly Farm from Tune Hotel. Can you imagine the cab fare to and fro? Initially, we wanted to book the car rental online. The cheapest was about MYR240.00 per day. Thankfully we didn't. Tune Hotel has a car rental counter and it's much cheaper. It also rents bicycles for MYR10.00 a day to bike around town and offers a hotel taxi service. Two of us took the hotel van to Kek Lok Si and it costs MYR15.00 per person. The ride was about 20 mins. DOES PENANG FOOD HAVE TALENT? As the date for my Penang holiday drew nearer, I announced my anticipation on Facebook and I got quite a number of trip advices. But mostly, they gushed about the great food in Penang and how "the taste is different from the hawker food in Singapore. Somehow, it just tastes better!" Frankly, I don't see what's there to rave about. The food there is platable. But forgettable. Perhaps it's a case of 'the-grass-is-greener-on-the-other-side' syndrome, but we definintely think that the quality and taste of hawker food here in Singapore is much better. In fact, we were trying to find evidence that Penang food is tastier so we went to many places to eat. From the famous hawker district of Gurney Drive to Mcalister Road, to obscure coffeeshops by the roadside, we went to places that were comparable to eating joints we would go in Singapore. Our very first meal : Hokkien Mee and Wanton Mee at food stalls opposite the Snake Temple. Now I know why there're no more snakes in the temple. To be near such bad food, anything would flee. The prawns in the Hokkien Mee looked and tasted like dried shrimps (hae bee) soaked in water for a week, and the dumplings in the Wanton Mee had too much fatty meat. And the barley water tasted like... hmmm... I don't know how to describe... I hope diabetic pee would begin to give you the faintest idea of what it tastes like. Fish Maw Noodle at a coffeeshop along the Goddess of Mercy Temple side of road. Initially I thought it is thick yellow noodle or another familiar mee cooked in fish maw soup, but no. The noodle itself resembled stripes of fish maw with a chewy texture. I kind of like it because the noodles absorbed the taste of the gravy with the fragrance of fried flour. Penang Laksa, Cuttlefish with Kangkong and Oyster Omelette at open-air hawker street along Macalister Road. These were what we had for a second dinner. Less than 10 mins ago, we had Chicken Rice, BBQ Stingray, 3 Stuffed Crab Shells, and Char Kway Teow at another hawker area further up the road. Seven items in total! Didn't take photos of the earlier dinner because we were too hungry and the dishes were no big deal. But the Penang Laksa was pretty good at this second place. The cuttlefish reminded me of skin-colored hearing aids while the Oyster Omelette was yummy. But again, it's not that yummy that I would go back again. Pigging out in Penang is very affordable. I think we spent a total of about S$13 only and we had BBQ Stingray. Chicken Rice with Roast Pork at coffeeshop next to Tune Hotel. The stall name is called 'Fatty' something. I can't remember. But I remembered the very friendly stallowner. All smiley and attentive, no wonder he sees a steady stream of customers. Plus, his Chicken Rice is pretty nice... Flavourful and satisfying. Curry Mee at New World Park Hawker Centre. New World Park Hawker is next to Tune Hotel as well and I thought it resembled the foodcourts of Singapore sans air-conditioning. A Penangnite from Facebook suggested that I could eat here, but I think the selection and atmosphere at the Macalister Road hawkers were more authentic Penang. New World Park Hawker Centre is located along Burmah Road and Macalister Road runs parallel to it. The array of food at NWP is extensive but not all serve the dinner crowd. We were on our way to Gurney Drive for dinner but thought we'd check out NWP since it's along the way. I wanted something that's Penang so I chose Curry Mee since I saw it often enough at other eateries. Bad choice. The curry broth lacked flavour and the cockles could be used as erasers. Bleah! I can't wait to get this mistake out of my mouth. In the spirit to experience that side of Penang at sundown, we decided to walk from our hotel to Gurney Drive Hawker Centre. It didn't look that far on the map. We walked for over an hour to get there. I was hot and sticky, my lower back hurts, and my tongue was still haunted by those rubbery cockles. Finally. Finally we got to Gurney Drive. We shopped a little at Gurney Plaza before checking out the hawker centre nearby. The ambience reminded me of Satay Club in Singapore eons ago with huge umbrellas proped up to shelter diners. It was drizzling slightly that night. Undeterred, I ordered Penang Laksa and an assortment of fried chicken skin and calamari. Yumz! The Penang Laksa here continued my delight of the same dish at Macalister Road Hawker. Its thick, white noodle was spongy and smooth, and the sardine broth was tasty. My only grouse is that there're no pieces of sardine meat to be found. Singapore's version of Penang Laksa is characterized by the chunks of fish meat in the soup, but in Penang, there's hardly any meat... just broth, spices, and noodles. Being protein-conscious, I preferred the meaty version. I had this dish, Salted Fish Fried Bee Hoon, at a coffeeshop around the Thai and Burmese temples. At first taste, my kidneys revolted. "We will report you to the Central Nervous System," they said. But after a few mouthfuls, they were coaxed to accept that the mouth is boss. Does this mirror the political situation in some countries? It's interesting that the very taste that made this order detestable was the reason that it was platable. I knew what salted fish taste like but I wasn't ready for the saline flummox. I have mixed feelings about it. It's like rushing outdoors to enjoy the sunshine and then telling the sun that it is too bright. Right about the third day there, we OD-ed on hawker food.